Parking is always challenging in Deep Ellum and during the Festival parking can be hard to find and expensive. Best to take Dart light rail which stops one block from the Festival. Official Drop Off locations for taxi, Lyft, Uber, etc. are at 3100 Commerce St intersection with Hall St., and 3100 Elm St at Hall St. This location is the center of the Festival. This location is also ideal for bicycle and scooter parking. If you must drive your car to the Festival you will find numerous public and private lots in and around Deep Ellum as well as limited metered spaces on Commerce and Main Street. Parking lot prices vary from $7.00 to $20.00++ and city lots $2-$5 and metered lots (pay by phone app available) $2 per hour. DART Rail in downtown Dallas has been temporally discontinued on Saturday and Sunday, to allow track replacement between Pearl/Arts District Station and West End Station. Six separate DART bus routes will be operating during the weekend closures to serve the festival and affected downtown stations. Check the DART web site for schedules. Featuring over 100 live performances from all over the metroplex and beyond performing only original music representing a variety of genres on four outdoor concert stages and two performance areas. Follow this link to Performing Artist listings and schedule. Over 200 juried Fine Artists from throughout the nation will be displaying and selling their original works at the Festival. The exquisite collections showcased will include paintings, sculptures, photography, jewelry, woodworking, ceramics, mixed media, leatherworks, fashion and other unique works of art and fine crafts. Follow this link to Visual Artist listings by name, booth number and medium for the 2019 Festival. 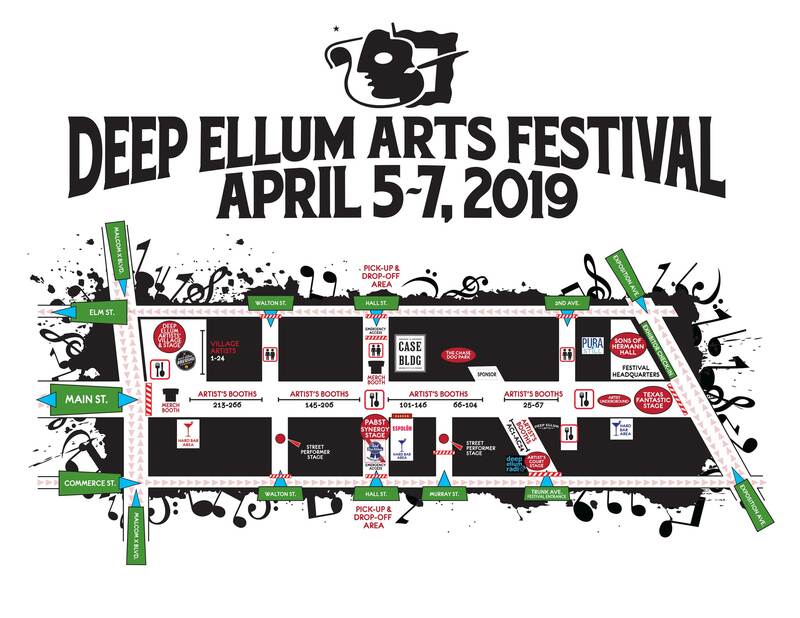 Situated at the main entrance to the Festival, the Deep Ellum Artists’ Village puts local arts and music front and center. While Deep Ellum’s distinguished musical acts mesmerize audiences from the concert stage, this space will be solely devoted to local artists creating live masterpieces and showing local artwork. The well-known Texas Lone Star Stage at Exposition Ave has been rebranded this year – The Texas Fantastic Stage! It will bring audiences a bevy of high quality local and national acts, with an emphasis on diversity and cultural performances. Local creative Iris Candelaria and local arts org/publishing company Wavelength Magazine have teamed up to bring a program of live art, poetry, dance, and interactive art activities. To celebrate the city’s homegrown talent, local arts magnet school Booker T. Washington will showcase some of their music ensembles–and some exciting, top-secret alumni. The Dallas Film Society Mini-Film Festival: The Dallas International Film Festival (DIFF) makes its triumphant return to Deep Ellum with a showcase of the best shorts of the last 25 years. The mini-fest takes place inside the iconic Sons of Hermann Hall on Friday, April 5 and Saturday, April 6. This year, the music on the Artist Court Stage at Trunk Street is being programmed by local favorite Deep Ellum Radio. Together with the Deep Ellum Artists’ Village Stage, this musical mainstay will bring a roster of heavy hitters from the local music scene. Official Festival Posters and various Festival and Deep Ellum souvenir T-Shirts are available at the merchandise booth on Main Street and Malcolm X Blvd near the Deep Ellum Artist’s Village and at Main Street and Hall Street near the Pabst Synergy Stage. The Artists in Motion Walk sponsored by The Case Building and Deep Ellum Lofts will kick off on Sunday at 12:00 pm, starting at The Deep Ellum Artists’ Village Stage at Main Street and Malcolm X Boulevard and concluding 6 festival blocks later at the Texas Fantastic Stage at Main Street and Exposition Ave. Local Deep Ellum groups and fans of the hood including the Mav’s Drumline and students from Booker T. Washington will be spreading good vibes and positive energy, inspiring smiles and high-five’s as they stroll down the festival site. All are welcome to join, and we encourage the wearing of fun, colorful “artistic” costumes There will be marching music, colorful characters and of course, plenty of delightful surprises along the way. Well-trained, socialized pets and their owners are welcome to join the Artists in Motion Walk and art related costumes are encouraged for both. We encourage pet owners to bring out their well-trained and socialized pets on Sunday only. For pet owners with pets participating in the Artists in Motion Walk, we encourage you to stop by one of the booths located at Hall Street and Main Street to pick up a goody bag for your furry friend(s)! We are better prepared for the additional needs of pets on Sunday, and the adjacent Deep Ellum Dog Park will be open. Please Note – Neither The Walk or the Festival are forums for political or cause-related demonstrations and they will not be permitted. Delicious, festival Cuisine! Festival restaurants and concessionaires will be serving a myriad of culinary delights throughout the festival including American funnel cakes, jumbo corn dogs, BBQ, and Cajun. Latino, Caribbean, Mediterranean, Italian, crepes and specialty desserts along with various health-foods. Beer, wine, and soft beverages will also be available for purchase. In restricted Festival Lounges cocktails can be purchased. In support of festival vendors and permit regulations, no outside food or beverages may be brought into or consumed on the festival site. IT IS FROM THE SALE OF FOOD AND BEVERAGE AND THE COMMISSION THE FESTIVAL RECEIVES FROM ITS PARTICIPATING CONCESSIONAIRES AND RESTAURANTS THAT THIS MAJOR FESTIVAL MAINTAINS ITSELF AS FREE TO ATTEND. All food and beverage sales transaction are conducted by exchanging coupons, which are purchased from coupon sales booths conveniently located throughout the Festival. (Concessionaires are not permitted to accept cash at any time). Cash or Credit Cards are accepted to purchase coupons and ATM’s are also located near coupon sales booths. Unused coupons are non-refundable and will be considered a contribution to support this annual Festival. Coupons are sold in strips of 9 for $10.00. Individual coupons are available for $1.25 each at designated coupon booths but with cash only. There is a minimum $10.00 purchase with credit cards. Follow this link for 2019 Festival Foods and Beverages. The Deep Ellum Entertainment district is an edgy adult-oriented area with bars, nightclubs, restaurants, and galleries. This visual and performing arts festival is also adult themed at times. While supervised young children and teenagers are welcome during the day, there are no activities specifically planned for them. The Festival will attempt to go on even if it rains (or snows, like it did in 2008). Short or light periods of rain will only delay the Festival but the show will stay on schedule. The weather savvy local audience dresses for the weather, ducks into local restaurants and bars, and comes right back out when the weather clears up. We maintain weather monitors at all times and will keep audiences posted if we foresee any severe problems. Outdoor restrooms are located at Walton, Hall and 2nd Streets. If any personal item is lost or found please drop by the Festival Headquarters at Sons of Hermann Hall during festival hours.